A little something different today…another Stamping Bella image, but this time, I didn’t color her with my Copics. I used my Prismacolor Premier colored pencils. I used a die set from My Favorite Things called Blue Prints. I have used them before. They are great in creating a card layout that is a little different. This one was called Blue Prints 15. For the background, I used an embossing folder from We R Memory Keepers. It is one of the new ones called Quilted. Since my paper was larger than the folder, I had to run it through my Big Shot, then turn the paper, line it up, and run it through the paper again. 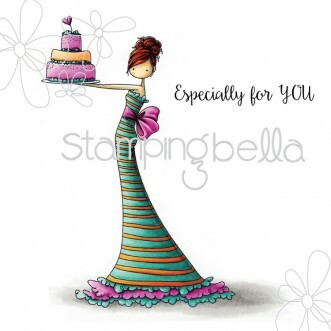 The sentiment is from the Uptown Girl Brittany the Birthday Girl stamp set. I stamped it in colored ink and then used clear embossing powder over the top. The pattern paper is from my stash. The embellishments are from Pretty Pink Posh. They are the clear dots that I colored with my Copic markers to match the colors.